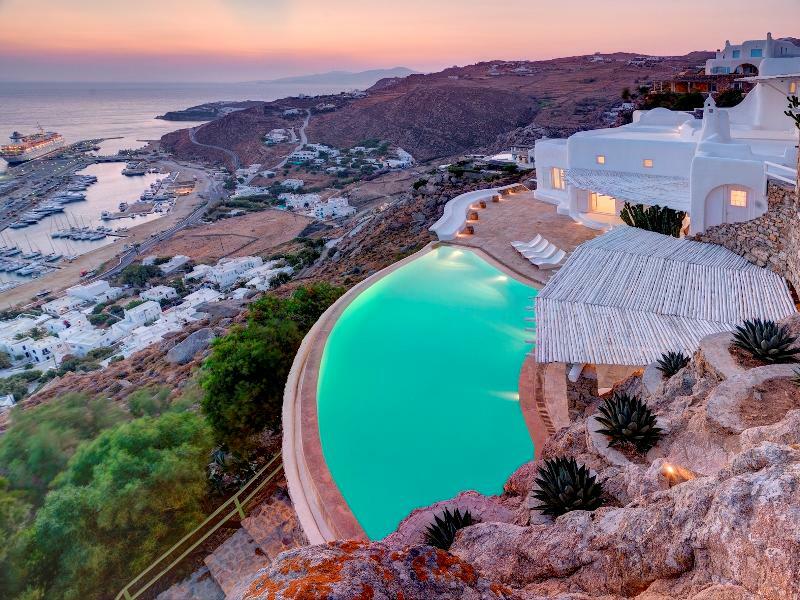 This stunning residence stands majestically on a rocky cliff above the new port of Mykonos. 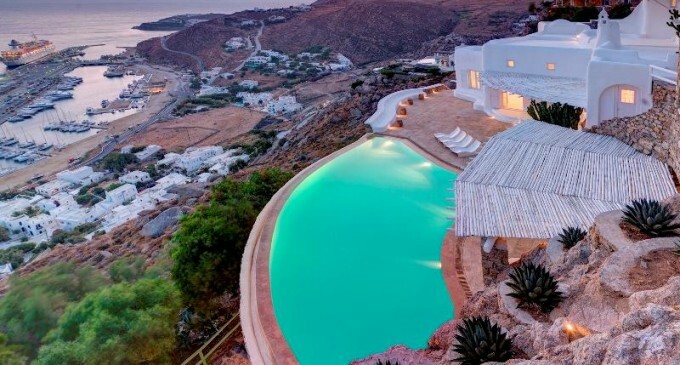 From its elevated position it affords breathtaking panoramic views of the town with its famous windmills, the Aegean Sea including the sacred island of Delos, and captivating sunsets. 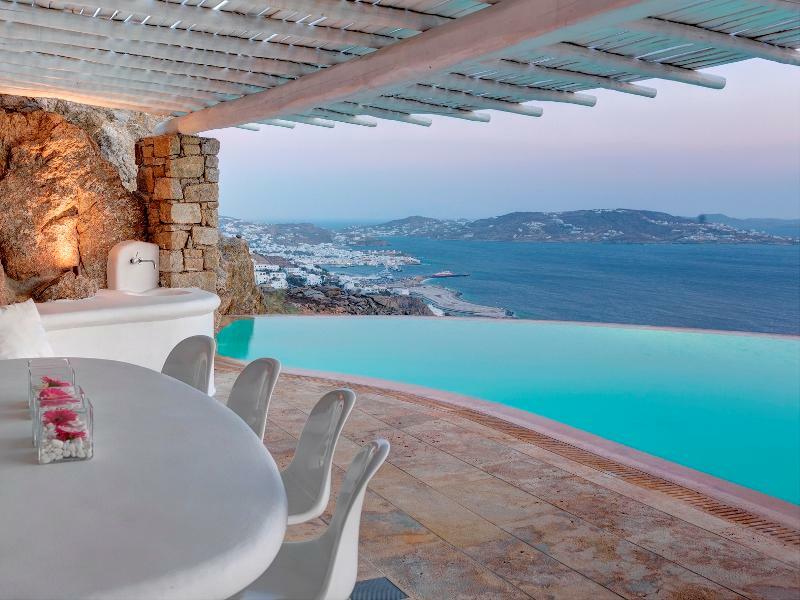 The property, dramatic and impressive, yet a serene and private haven, is only a few minutes away from the lively and cosmopolitan town of Mykonos. appealing built-in sitting areas and several windows that take full advantage of the light and the fabulous sea and town views. A few steps lead up to the dining area with a fireplace and on to the unique fully-equipped kitchen. Special features include beautifully exposed rock formations, thick wood-beam ceilings, and plentiful arches. Two spacious master bedrooms with their own bathrooms complete this part of the house. In the garden, two stone-built independent suites allow guests to enjoy their privacy. Broad stone-paved terraces surround the villa while fan-shaped pergolas and a covered dining area are ideal for relaxed summer entertaining. A horizon swimming pool merges with the azure seascape and overlooks the town. The island’s natural rocky terrain is perfectly preserved and highlighted with abundant mature cactuses. A separate studio for staff and sheltered parking space are situated at the side of the property. House Size: 6,996 Sq. Ft. Lot Size: 43,056 Sq. Ft. 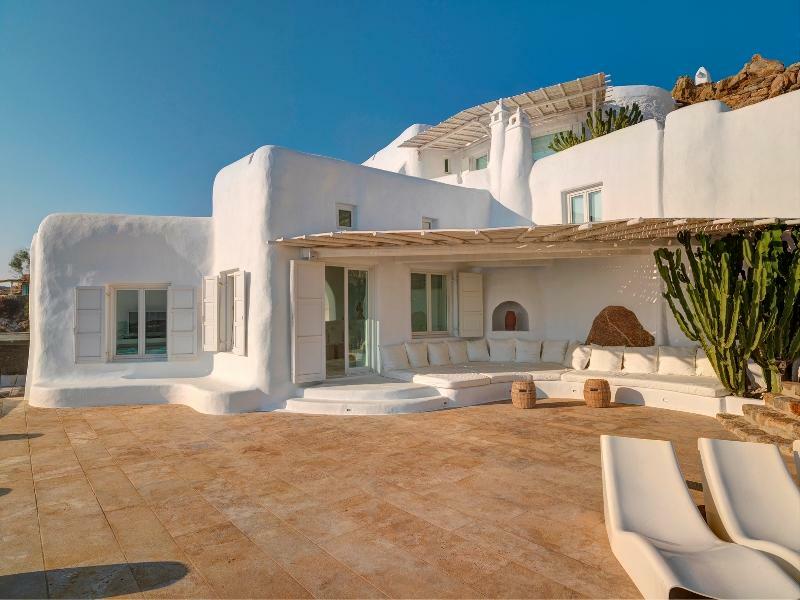 Specialty Items: Panoramic Views, Stone-Paved Terraces, Swimming Pool, Detached Staff Accommodation.